Autumn Equinox (Sun 00Libra00), September 22, 2009, 5:18:30 pm edt, Washington, DC; Hour Mercury Rx in 7th house conjunct Saturn 25Vir38 Rx; chart-ruler Saturn opposite chart co-ruler Uranus 24Pis25 Rx in 1st house. Please click chart to enlarge and read more details. 1. Saturn sextile Moon, a serious contact for the Moon (the people; the public), indicating common sense, modest ambitions, patience, and a need to undertand the problems of others. Hebe's conj to Moon seems to contradict this yet on another level, Hebe may signify someone or persons of the Hebrew race as well. Astrology is nothing if not as complex as the life it describes on many levels. 2. Saturn square Pluto (5A04), the sore loser aspect, which represents oncoming obstacles and blockages that relate to their opposition of 9/11/01; it shows those who are defensive about fulfilling their social responsibilities to the point of bitterness; attempts to grasp control are in evidence with this difficult square. Of more timely interest is Pluto squaring the equinoxial Sun from 11th house to 7th. Sun SQ Pluto (0A41) is the might makes right aspect of willfulness; a chip is on the shoulder and one fights first, talks later (if at all.) Powerful, secretive Pluto may be blocking the president's will, it seems, since the Sun in a national chart indicates the leader. One assumes his safety is being guarded successfully and will continue to be; Pluto's connection to nuclear issues coupled with the Mc/Ic axis having '6/7 Gem/Sag' upon them isn't especially comforting to this particular worrywart Capricorn. Making decisions based on evidence rather than on personal feelings or biases is an issue with a Sun/Pluto square, so we'll see if the Pentagon and the president coordinate their wills concerning sending more US troops to the Middle East. A lovely contact is Uranus trine Moon (2A06) which gives a broad perspective, a willingness to listen to others, and much coping ability - and that's for the Moon, the people! Mercury/Jupiter = Mc: a desire to build up; optimism; fondness for talking; a wealth of ideas; a good speaker, scientist, or businessman; professional success; successful planning; looking for the upside to come about. Jupiter/Saturn = Mc: thinking with grandeur; a philosopher; fluctuating success; changes; losses; inhibitions. So it's nine years later and what have we got for Autumn EQ 2009? Sun to Libra, Moon in Scorpio, as it was on Inauguration Day 2009 though then at critical or crisis degree: 29Sco45. Sun Lib-Moon Sco is an Air-Water blend with an exacting sense of justice, a clever manner when delivering clear-headed judgments, and a talent for impartiality. There can be a tendency to manipulate others, but who doesn't? This combo indicates a crusader for social harmony, so with Jupiter/Saturn's blended energies at Mc, and progressive Uranus Rx opposing Saturn (their last exact stand-off was on Sept 15), the atmosphere continues to be drenched with further debate on Health Care/Insurance Reform, and tradition vs progress. 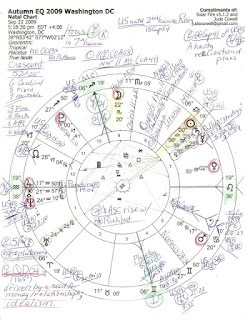 Plus, the Nodal axis falls across the 6/12 polarity of health and hospitals; NN = Neptune/Pluto midpoint: 'group study projects; metaphysical research' but apparently they are occurring behind the scenes of the 12th house. This may relate to oil, gas, and coal industry types in secret meetings, too. Sept 22, 2009 marks the opening of the UN with President Obama addressing the General Assembly today, and unrest at home (Mars still in Cancer) continuing. Will some sore loser shout out rudely? Will el diablo be back in the house? Well, Venus 2Vir50 looks a little lonely in 7th house, doesn't she? Her only applying aspect is a square to this Mc, although she was recently trining Pluto (2S09.) Vengeful Venus was conj the Solar Eclipse degree of Nostradamus' 'Mother of All Eclipse' of August 11, 1999...Venus triggered the eclipse on the morning of 9/11/01. In the 2009 EQ chart, you see that Jupiter Rx is rising @ 17AQ50 (17AQ = the end of progress degree, and Ronald Reagan's natal Sun degree); yet Jupiter at ASC usually indicates some sort of protection in the proceedings. Jup/Nep = ASC: speculating; living in an unreal world; sharing great hopes with others; having an emotionally rationalized agenda. Chiron is at ASC, too, but you'll want to ask Julie Demboski about that - she wrote the book on Chiron. Pluto 00Cap41 (one minute off his Direct Station degr 00:40 on Sept 11, 2009) conjuncts the US Constitution's natal NN 1Cap09 (Sept 17, 1787, Philadelphia, PA) = powerful contacts and encounters. Mercury/Saturn = Sun: getting down to work; discipline pays off; knowing what's got to be done; changes; separations. Well, I know what's got to be done - it's almost 2 am and the sandman is calling my name, so if there's something that simply must added to this EQ post (including repair of typos so prevalent when I'm fatigued), it must be added tomorrow afternoon. Your further analysis or comments will be much appreciated. Forgive me if I cover ground you already walked on, but there are several things which jump out from this chart. Of course, there's Jupiter et al on the Ascendant. And what are his relationships? Hard adjustment via the quincunx to Saturn/Mercury as well as Mars, who's lingering on the cusp of the Sixth. Since Mars is sextile Saturn/Mercury, we have a Finger of God (or Fist of God or whatever you call it) with this group on the Ascendant. The natural Jupiter optimism we're being shown as the Face of Government or the Face of the Situation will need to, perhaps unwillingly, adjust to hard reality (Saturn/Mercury) when it comes to what Others (7th House) will offer from their Shared Resources (cusp of the 8th) in order to achieve those goals (Mars) which could affect our daily life (6th House) as well as our health (Ascendant). Saturn/Mercury in this adjust and then re-adjust relationship with Jupiter indicates a much needed, factually based, insistent influx of information popping the delusional "all is fine and wonderful and good" Jupiter bubble. Then there's Mars. He's trine his current ruler, the Moon, and sextile Saturn/Mercury. But he's also powerfully placed on the cusp of the 6th, our day-to-day schedule, our daily work, as well as how we care for ourselves (our health being reassigned to the Ascendant, I believe). So, it's safe to say that Jupiter is really, REALLY not appreciating Mars -- supported by a trine with Uranus and a sextile with Saturn/Mercury -- ganging up on him and demanding the work that needs to be done being done! "Enough with the hot air and happy talk", Mars and Saturn/Mercury say. "Get to work!" Perhaps the relentless, stubborn tag-teaming of Jupiter will get him to admit that all ISN'T perfect and good? Adding to the complication, Mars, the ruler of the 2nd, and Venus, the ruler of the 8th, have no relationship in this chart. Those Houses of What We Value as well as What We Share aren't really in sync this time around. Judging by the combined strength of Saturn and Mercury's need to communicate -- even if he is going to backtrack and correct himself in October --, the Approved Message will continue. But the Grand Trine between Mars, the Moon and Uranus indicates the change we, the people, are seeking when it comes to making this, whatever this is, happen is supported. And with this Mercury Retrograde in opposition to Uranus, the Approved Message will have to change. As it is, the People are already beginning to tune out The (Overexposed) One. But those Fixed Angles, save for the MC ruled by that prominent Jupiter, really do show a stubborn adherence to The Plan and The Approved Message, don't they? If Obama really DOES have an astrologer on-board, I'm beginning to wonder just how talented this person is!